Tomatoes planted in open ground or temporary shelter film. After three or four weeks they get stronger and start to grow. There is a popular mistakes gardeners in the cultivation of tomatoes in open ground and temporary shelters. Food. 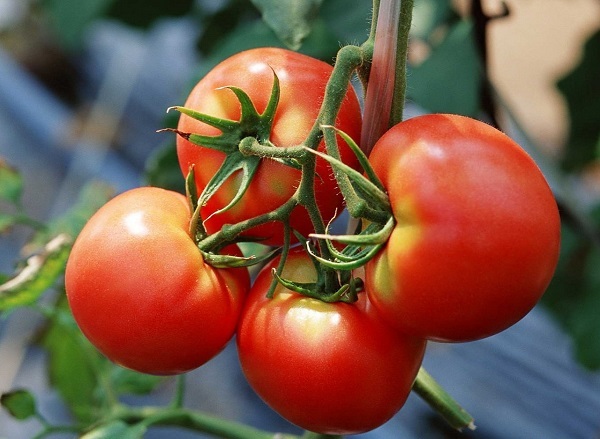 When first brush the fruit on the tomato plants first feeding includes only phosphorus-potassium fertilizer, 20-25g/sqm of superphosphate and 15-20g/sqm of potassium sulphate. At this time unacceptable nitrogen fertilization infusions of mullein, urea and other Plants instead of fruit will "green mass" and will "fatten". In the future, with increased fruit formation, for better growth and ripening of the fruits of the fertilizer consists of nitrogen-potash fertilizers. 1 sq m make 15-20g of ammonium nitrate and 20-35g of potassium sulfate. Watering. After the plants have taken root in the garden, in 10-15 days the tomatoes without pressing need it is better not to water them on "dry rations" formed powerful root system. First make the glaze at the root. Then alternate watering between plants and rows. The entire surface of the soil under the tomatoes watered only with intensive education of the fruit. Watered 1-2 times a week at most. It all depends on the weather and condition of the plants. In good weather, watering is carried out in the morning and not cold water. Loosening the soil. After the first irrigation the land is cultivated to 8-10 cm, somewhat deeper than subsequent tillage (5-6 cm). It has a beneficial effect on the "breathing" roots and better soil warms up at the "feet" of tomatoes. The ground mulch the cut grass, straw, etc. Prevention of diseases. Weekly one sheet the bottom and remove the old, damaged leaves that have already fulfilled their "work". When growing tomato plants in plastic cover ensure that the tomatoes are not "tired" and the film does not drip condensation. The optimum moisture content - not more than 70%. At temperatures above 30 ° C the fruit is not fastened. Tomatoes are plants that have "legs" in comfort and "head" in the fresh air. Tomatoes will not yield in shaded areas. When lowering the temperature to 10 ° C from tomato plants stop growing, and at 15 ° - they are not in bloom.